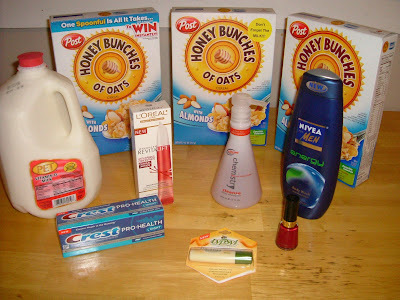 Centsible Savings: I Made $19.20 at Walgreens! I had resigned myself to not being able to use that $10/$40 coupon last weekend because we only have one vehicle right now, so I don't usually get to go out except on my regularly planned grocery day. Saturday afternoon it all the sudden dawned on me, "Hey, hubby's home today. That means the car is here. That means I can go somewhere. Hey, I can go to Walgreens!" So I hurriedly threw a bunch of coupons in an envelope to see how I could do on a spur of the moment trip. Well, it turned out pretty good! I did 3 different transactions. I got the monitors because I had coupons to get them for free. 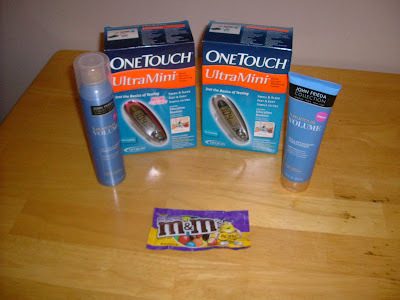 That got my total up high enough where I could get the John Frieda for free to check if the RR were still working. I forgot that the Revitalift was on sale, so my total wasn't up to $40 when I checked out. I ran and grabbed the milk, and the $10/$40 still wouldn't work. The manager came over and told me it must be because my total before tax still wasn't high enough. I asked him how much more I needed and he said "I don't know. Just get something and we'll see if the total is high enough." I would have preferred not to do that, but I didn't want to be rude, so I just got the cereal. It wasn't a big deal because it is something we will use. Hi, I went to Walgreens to get the Crest Pro-Health and the Manager told me the rebate was for the Whitening Pro-Health ONLY. You might want to check that out. Great job on your deal, I did something very similar.